About 3 years ago I mentioned to Sen that I thought it would be a cool idea if we came up with a super small game that we could include in a letter to publishers as a ‘free’ gift when submitting other games. For some reason I thought this would be really neat and make us stand out. I set to work on a tile placement game about trying to have more of your houses in a neighbourhood than your opponent. I managed to get the game down to 25 tiles. I made a small little matchbox-like package for it and viola – we had a really cool pocket game! (I’m glossing over the fact that it took more than a few stabs at the game until we got it to its final state). Once that was done, I was feeling pretty motivated about how we got a Euro-style game to fit within 25 tiles. It got me thinking and I remember for one 5 hour flight from Toronto to Vancouver, I brainstormed all the different genres of games and then tried to see if I could come up with a way to make it using only 25 tiles. At the end of that flight I had ideas for 11 games! The benefit of reducing an entire game into 25 tiles, is that you’re forced to eliminate anything extraneous which ensures the cleanest and simplest of rules. Some of these games that we made were pretty minor and didn’t have much fun to them, but others had a gem of an idea in it that were not only fun but enabled us to turn them into bigger full-fledged games. Belfort, our game that is coming out early next year, started as a game that had only 25 tiles. Hard to believe when you see the final game that it started out as only 25 tiles! Some tiles were used to track how many resources each player had (by rotating the tile so that a specific number was facing up), and the other tiles were buildings that players could build. The first time I played it with Sen, I was excited to show him how we were able to get a resource management game to fit within 25 tiles! As soon as Sen finished playing it he said that he really liked it, but that it begged to be a bigger game! We spent the rest of the weekend turning it into the first prototype of the game that was to eventually be known as Belfort (it was called Castletown back then!). Other smaller, 25-tile games we have made that we eventually turned into larger games have been Akrotiri – a pick up and deliver game, and Lost for Words – a word search/creation game. Both of these games are almost ready to be shown to publishers right now. There’s even a couple more games (EIEIO – a quick reflex party game and This Town Aint Big Enough for the 2-4 of Us – and area majority game) that we’re thinking of converting to bigger games as well. This was just our way of motivating our creativity, but you could use other constraints as well. 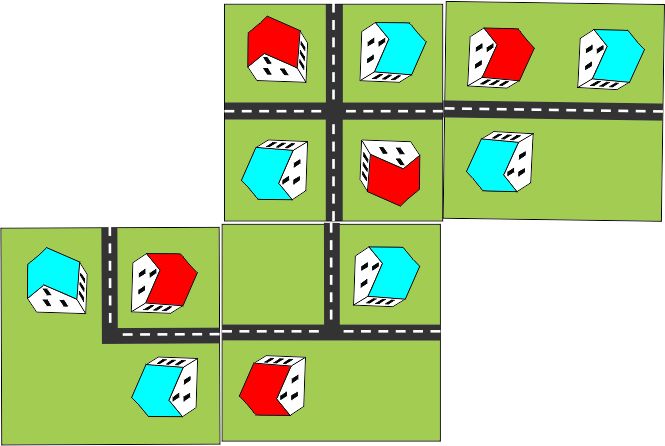 Try making a game using only dice and face cards from a deck of cards; or a game using only a checkerboard and 10 custom cards; or a game using coloured cubes and a piece of paper…you get the idea. Try to make the most basic game using only a couple basic items and you might find yourself with either some new ideas or a really interesting concept for a bigger game. I am, by nature, an extremely divergent thinker. This is really just a polite term for “tangential”, or, as my wife would say, “focus-challenged”. Personally, I prefer “free-thinker”. I’m the kind of guy who has what could be only be termed as “chronic creative diarrhea”, constantly coming up with idea after idea after idea. I spend a lot of time coming up with all the cool things that could possibly work together in the game, invariably ending up with a mashed-up monstrosity, and then I have to spend even MORE time cleaning up the mess I’ve made of what had started out as an interesting game. Enter self-imposed constraints. By placing limits on ourselves, Jay and I can steer clear of thematic traps more easily (i.e. adding something for the sake of making the game fit a specific theme better), minimize cost of fabrication, and reduce the time from it takes to get a game from a “brain fart” to the prototype stage. This last point is the most important to me, as I am admittedly the kind of designer who would spend eternity tweaking things in my mind before ever committing anything to a physical format if you let me. But by saying “Hey! We’ve reached the 25 cards limit – time to print and cut!”, we can get to the most crucial part of the game design process faster playtesting. While I am good at recognizing strengths and flaws in game systems in my head, I can’t account for everything once the number of variables gets unwieldy and I can’t account for how different personalities will interact with the game. The physical components themselves can also change how a game is played. And to realize that, the game has to be made a reality. These small games are simple by nature so they the rules are quick to teach and easy to pick up. The set up time is minimal and the games themselves take only minutes to play at the most, so many rounds of play can be racked up in a short timespan. Thus, we can accumulate valuable data on actual playtesting by other playtesters. Jay and I are then in a better position to analyze the game as opposed to doing all of the guess work in our heads. This allows us to prioritize which ideas need to be expanded up immediately, which worked but can sit and wait, and which are never to be heard of again (except, for some reason, on this blog…). Of course, this design ethic doesn’t work for every game and not every game we make starts off this way. Some games aren’t going to fit within 25 cards straight from conception. “Train of Thought” and “But Wait, There’s More”, both word-based party games, were designed without the 25-card limitation because, really, how fun would a word game be with only 25 different words available to use? We’re currently designing a trick-taking game called “Lions Share”. We’ve limited ourselves to 55/110 or 60/120 cards in this case. Those limits are actual real-world constraints we’re using to ensure that publishers will look at the game without production reservations. The maximum number of cards that can be made on a single sheet of stock of standard dimensions is 55 by Imperial measurements or 60 by the Metric system. Going over those limits will actually affect the bottom line for the publishers, so having 60 cards in a game can be more appealing to many of them than needing 68 cards, even if the 68-card version is a better game. Using non-standard card sizes is costly as well as a custom die needs to be created. So, whenever possible, stick to 55 or 60 cards in a deck (or multiples thereof). We’re also trying to solely use cards for “Lions Share”. This constraint was put on in response to the fact that a lot of publishers are requesting card games. As a game design team that is not looking to self-publish, we’ve got to cater to more than just the game players – we need to ensure that the publishers like what they see from a fiscal standpoint as well as the gameplay. So we want to design games that they want to publish. The cheaper a game is to produce, the more likely a publisher is to take a good long look at it. If, for some reason, we desperately need chits or dice or some other component it’s not a deal breaker as these are self-imposed limits. But we’d like to try to remain true to our limitations as we see a need for a game of this variety in our portfolio. Working with these constraints for some time now has shown me that there is still complexity in simplicity. Simple games are much more elegant than the bloated systems we sometimes see in some overblown games on the market. The old adage is true, sometimes – less can be more. It’s an odd fact to try to wrap your mind around but constraints can actually be liberating. Whether it’s trying to keep a theme intact or trying to only use a specific type or number of components, limits allow you to declutter your mind and work only within a space that you’ve defined, free from having to think about anything outside your scope. It seems counter-intuitive to think that limiting creativity is a good thing, but I challenge you to give it a try. Limits can actually force you to be more creative in order to solve problems in very different ways. Having no constraints on your design process can leave you in a position of analysis paralysis where everything seems possible but you are unable to take the game from concept to a playable format. So, if you choose to place constraints upon your game design process, the world may no longer be your oyster. But I’ll bet that you find you come up with some real pearls. This entry was posted in Misc. and tagged akrotiri, Belfort, board, castletown, constraint, design, eieio, game, limit, lost for words, Thought, tile, town, Train, wait by designerjay. Bookmark the permalink. It’s a bit of a tangent, but the issue of constraints comes together with Jay’s love of movies in “The Five Obstructions”, a sort of filmmaking challenge between Lars von Trier and Jorgen Leth. Constraints are always liberating, for the same reason that you can do more with a laser than a light-bulb. I love that concept, Boyd – thanks for that! “You can do more with a laser than a light bulb” = my new phrase of the year. It’s akin to the last phrase of the year – “He couldn’t sell hotdogs in a ball park”. That was something our shuttle driver said to Jay and I when we were chatting about something game related. I have an almost desperate urge to argue with Boyd about “more’ and “different”. Humans are really bad decision makers. The more choices we’re offered, the less likely we are to take action at all. Considered analysis of the options disintegrates pretty fast too. The implication in creative work is that limits are your friend, as you all note. The implication for game play is that games with a lot of choices, like Scrabble and Magic and chess, can take FOR-EV-AR to play. And for game design, you want to give the players just enough freedom to keep the game fresh, with enough limits to keep it moving. It just occurred to me that there’s another implication to this. Many of the most challenging and interesting games to play have simple explicit rules, and enormous complexity in the implied rules. Risk, poker and bridge come to mind: in each case the complexity is mostly in the social interactions overlaid on a relatively simple game mechanic. Great blog, guys! Glad you’re going to be on store shelves for Christmas! Thanks, Julian – and you’re right. Most often, it’s the meta game – the game that continues well after the match itself has taken place – that keeps people interested in the game, talking about it, thinking about it, and developing it further. Magic, with it’s deck building, is a good example of a game that took on a life of it’s own. Poker, with all of the subtle nuances, the mathematics mixed with the tells and bluffs is another great case in point. It’s the social interaction that makes board and card games next level compared to video games. And it’s the simple, accessible mechanics that help players, new and old alike, share a common vernacular so they can communicate – so veterans can lay out profound wisdom while newbs can learn. If the ruleset is too complex that the game is unlearnable, there is a problem. In the context of putting limitations on the design process, the metagame is really the thing that designers should be aiming towards developing, in the big picture – the culture surrounding the game is as important as the game itself, if not moreso. It is what sustains the game and breeds longevity. In putting limits on your game design, you should hope to make a ruleset that is clear, consistent, teachable, and transferable so much so that it becomes “open source” so that others can develop and discuss the game beyond the game. If you don’t put limits on the game design, you run the risk of making something that is beyond the capacity of people to turn into their own. BTW, if you’ve never heard of the famous “jam experiment’ by Sheena Iyengar, it’s a study on the effects of limiting choices for people and how doing so can help vs. giving all the multitude of options. In the experiment, she had a table set up at the supermarket with jams. Sometimes there were 24 choices to sample, sometimes there were only 6. The research she conducted showed that only 3% of the people presented with 24 choices bought jam afterwards while 30% of the people who were given the more limited amount of choices bought jam afterwards. Iyengar would say that making choices both shapes who we are and is shaped by who we are; and the making choices is less of a science and more of an artform. Interesting post, and while I can’t comment on the effects it would have on something like a board game, which is obviously designed specifically to be used by other people, I’m wondering whether or not writers/directors would find this approach useful.